Free Meal at Chic-fil-A on July 12! On July 12, dress like a cow and get a free meal at Chick-fil-A. A full costume gets you a free meal; a partial costume gets you a free entree. 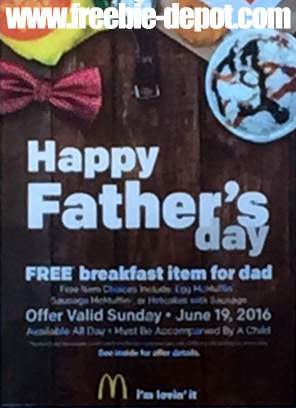 Celebrate Dad with these FREE Deals for Father’s Day! Celebrate World Oceans Day with a FREE tote bag at Rubio’s restaurants. You will need to print the coupon here and redeem June 8th or 9th. Free Video Game Rental at Redbox! Grab a free game rental every month from Redbox by texting “GAMETIME” to Redbox at 727272. Redbox rental kiosks can be found in nearly 40,000 locations in every state.